Starting with the top class, EnduroGP, where Alex SALVINI (I - Husqvarna) was forced to retire on the third lap, the fault of a poor quality fuel... the Italian, who was the leader of the category when he arrived in Edolo, lost big points and could only watch as his closest competitor, Steve HOLCOMBE (GB - Beta) took first place. In fact, today the reigning World Champion barely put a wheel out of line! Very comfortable in the mud, the factory Beta rider impressed everyone by winning with a gap of more than 1 minute 27 ahead of his first pursuer, Brad FREEMAN (GB - Beta Boano). It's now HOLCOMBE who leads the standings, 12 points ahead of the unlucky SALVINI. Jamie MCCANNEY (GB - Yamaha) also had to give way to a very neat Eero REMES (SF - TM) today, and his teammate in the Outsiders Yamaha team, Loïc LARRIEU (F) completed the Top 5. Danny McCanney picked up a minute penalty but still scored in 13th. 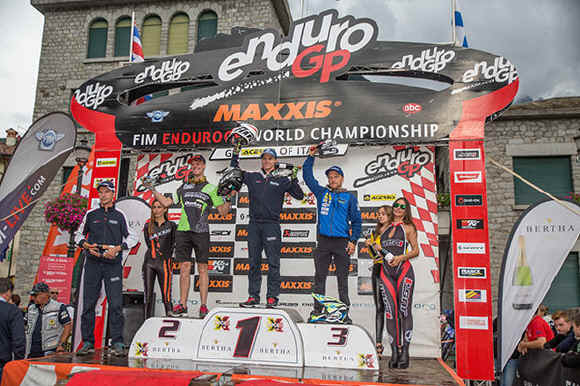 Alex Snow was 21st and Josh Gotts was 22nd..
SALVINI's DNF also shook up the standings in Enduro 2, since with the victory of Eero REMES and the second place of LARRIEU, the Jolly Racing rider can now count only 13 points ahead of the Frenchman and 14 ahead of the Finn. "Salvo's” mistfortune also benefited Thomas OLDRATI (I - Honda RedMoto); often well placed this year, the 2008 Junior World Champion took his first podium with the 450CR-F! 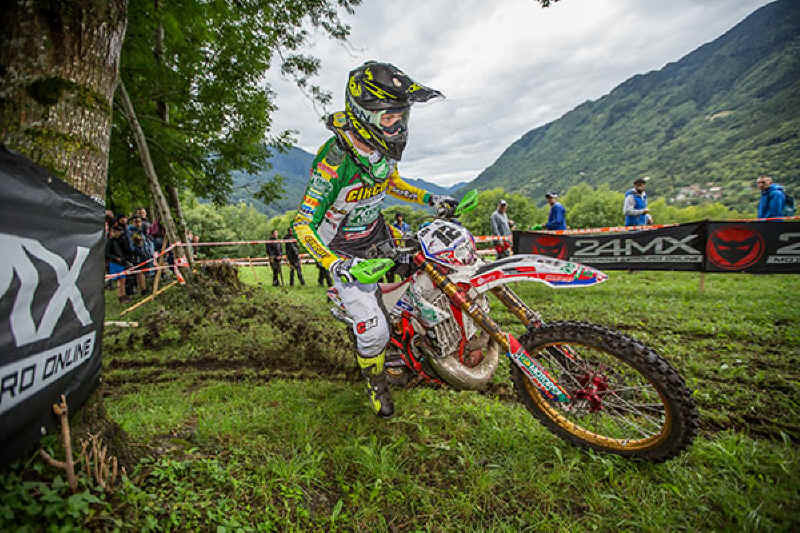 He was ahead of his compatriot and crowd favourite, Giacomo REDONDI (I - Honda RedMoto) by only 3 seconds, while Christophe CHARLIER (F - Beta) proved that he has recovered from his fall at the Trentino GP taking a convincing 5th place. Finally in Youth 125cc, Ruy BARBOSA (CL - Husqvarna), current leader, had to concede defeat in conditions he's not very comfortable in! 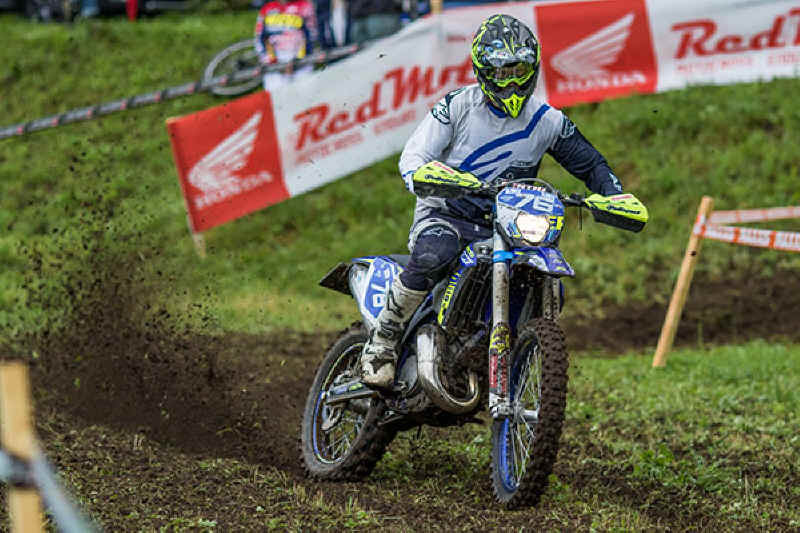 The Chilean could not cope with the pace of New Zealander Hamish MACDONALD (Sherco), who for the first time in his career won a day in the World Championship and became the first New Zealander to win a round of EnduroGP. Dan MUNDELL (GB - Sherco) made put another CH Racing team Sherco on the podium, while the Belgian Matthew VAN OEVELEN (Sherco) was forced to retire with bike troubles on the first lap... Alex Walton was 8th. Brad FREEMAN : "Steve was really strong today but my main goal was to win my category and I did just that. It was a nice duel with Jamie as it has been from the beginning of the season but I had to grab more points, we are never safe from DNFs in this sport as we've seen... "
Eero REMES : "Like me in Estonia, the mechanics let Alex down and that's a shame. But it benefits me and together with Loïc, we are back in the running. The rest of the season will be more interesting. I'm satisfied also with my podium in the EGP class, despite some mistakes in the last lap! " Thomas OLDRATI : "Finally! I'm really proud to be on the Enduro 2 podium in front of my home crowd and with the Honda! The day has not been too difficult and we must pay tribute to the Moto Club for their fabulous work... Tomorrow is another day and I hope I can taste the podium again... "
Alex SALVINI : "It's impossible not to be disappointed when today ended with a problem like this... But it's the game, everyone knows it and it can happen at any time. I must turn the page and focus on tomorrow. "